Okay... so yesterday was one of those days where nothing really went according to plan or as we expected. I often tell people that having a plan is one of the easiest ways to provide consistency and ultimately success in eating well and getting exercise in. I realize though that there are times when our plans don't work- that is just life. I also often suggest to people that they have a stock of foods that they know they can easily throw together for a quick meal. Back to yesterday...We got home later than we anticipated from work and had only a little bit before we had friends coming over. People always ask me what our quick go to meals are, and I have started to feel boring telling people the same 3 or 4 that we usually choose. So, yesterday, I felt the challenge to create something different than we usually do. We decided to make tuna cakes! Tuna is one of our go to proteins in these situations because it doesn't require thawing, cooking, or really much at all. It is also a great source of lean protein, has some omega 3 fatty acids, and some vitamin D as well. When buying tuna, get the tuna in water, not oil. Also, looked for canned light tuna instead of canned white. Canned white comes from albacore tuna, which is a bigger fish- meaning it has higher mercury content. Don't overdue tuna because it does contain mercury. For most individuals including those who are pregnant and breastfeeding, limit intake to about 2 cans of CANNED LIGHT TUNA per week (12 oz total). If you are choosing canned white tuna, limit intake to 1 can per week. Mix all ingredients in a bowl. Form into 2 patties with hands. Heat a sauté pan with 1/2 tsp Ghee or avocado oil. Place patties in pan and cook until browned on the outside- flipping halfway through. 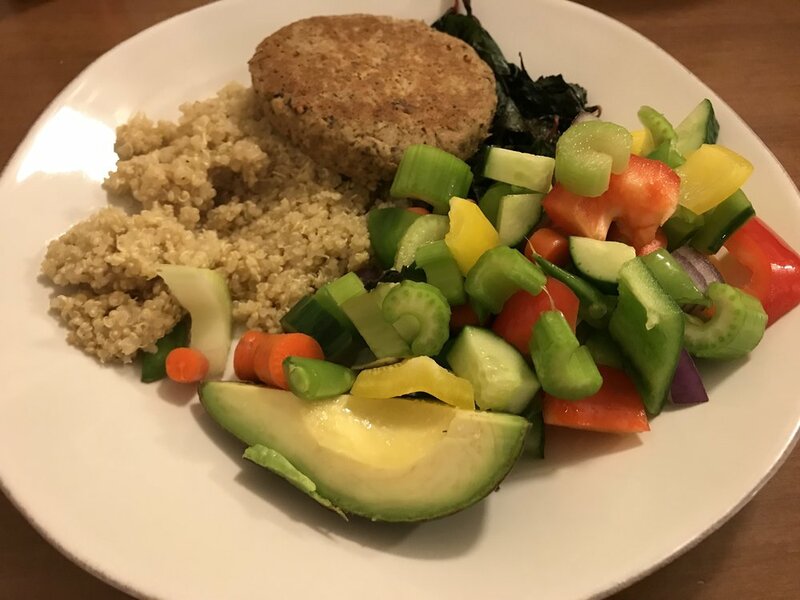 As far as the rest of the meal goes, we whipped up some quinoa and a mix of the veggies we had around already including sautéed garlicky Swiss chard: sauté roughly chopped Swiss chard in a tiny bit of Ghee/avocado oil with a couple of cloves of minced garlic, salt and pepper. And viola! We had a satisfying, well balanced meal! And one to add to our list of quick ideas. Give it a try! Or figure out what kind of quick meals you can make when a crazy day hits and get the ingredients, so you know you're prepared! Older PostChili and Cornbread for Halloween!